A 21 year old Industrial Engineering student Mosidinyane “Sidi” Moleko was one of the confident students who went to the podium and auditioned for the Goodhope Fm radio dj search. Helen Zondi. 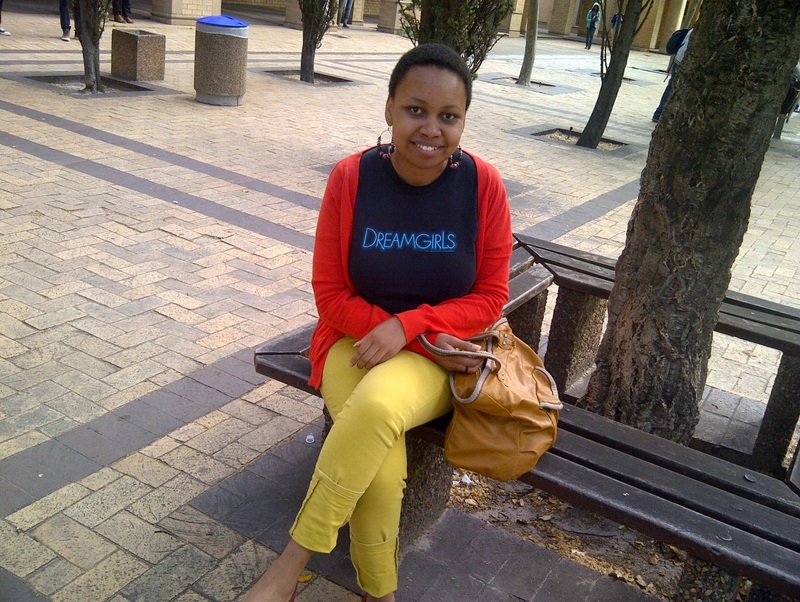 Goodhope FM campus Dj search winner Sidi shares as delightful smile after the show at CPUT Bellville campus. Photographer: Helen Zondi. Without a doubt the crowd instantly fell in love with her voice, she was not nervous at all; one would have sworn she had radio experience prior to the audition. She surprised the crowd and stood out from the rest that had auditioned before her. And the judges did not hesitate placing her through to the second round. GoodHope FM surely brought a bit of entertainment to Bellville campus at the Cape Peninsula University of Technology last week. The radio station had their annual Campus DJ search auditions for students who believed they have what it takes to be an aspiring radio dj show host. The auditions were very entertaining; it had people in stitches including myself. Some were stuttering nervously, while some made mistakes by not following their scripts. I recall a guy who said “You are tuned in on your favourite radio station Metro Fm” instead of saying “GoodHope FM”, the crowd couldn’t help but laugh. All those who had impressed the judges had to come back the following day and audition with a new script. There could only beone winner, walking away with an ipad, which Sidi won and is now one of 6 finalists across Cape Town. She continued to say, “When I found out I had made it to the second round it was incredible, and I was really excited about it”. The competition was not easy at all, everyone who had made it to the second round was determined to take the ipad home and make it to the finals. I asked her what went through her mind hearing made it to the finals, “I thought wow, what a blessing, a few days before that I didn’t think it was going to happen. Yes I won an ipad but I also walked out thinking ‘this is my chance now’. She knows the finals would be tougher than the auditions, it will be best amongst the best of the chosen ones. Each of the finalists will co-host an hour on the Ozone with with Seano on Mondays to Fridays from 15:00 to 18:00. The judges will then decide who the winner will be and offer the winner a contract on Goodhope FM, but she is all relaxed and humble about it “I’m going to go there and do my best. By giving what I have to offer and I’m a chilled conversational person this is just how I am, I’m hoping it will be enough and people will like that” she concluded. We are wishing Sidi all the best and hoping she wins the competition as she’ll be representing all of us at the Cape Peninsula University of Technology.